The controversy triggered by anti-national sloganeering on the Jawaharlal Nehru University campus on February 9 – attributed by campus residents to an outsider group – has snowballed into a bitter and emotive national debate outside and inside parliament. JNU has become a no-holds barred/no-quarter given, zero-sum battle over what constitutes ‘nationalism’ and how supposed transgressions from the ‘norm’ must be dealt with. Many institutions have joined this charged debate and some among them stand compromised or tainted. Here the conduct of the Delhi Police and the lawyers who resorted to vigilantism in Patiala House and attacked JNU Students Union president Kanhaiya Kumar are a case in point. Some media houses have also been guilty of the most deplorable lowering of professional standards. By unfortunate happenstance, the JNU controversy erupted around the time when uniformed personnel have lost their lives in counter-terrorism operations and both Pathankot and Pampore have become synonymous with the surge of patriotic fervour – particularly in the audio-visual and social media. An avalanche in Siachen led to the tragic loss of more lives during the same period, including Lance Naik Hanumanthappa, who defied nature and the odds to survive – briefly – before he too alas, succumbed and was mourned by India. Given this charged national mood and the anger over the anti-national slogans at JNU that was stoked by some constituencies, it was predictable that one cross-section of ex-servicemen would wade into the national debate and become the guardians of nationalism and the national flag, especially on TV debates. Every night, India has been witness to a surfeit of righteous indignation over the university’s many transgressions – some going back over the last 15 years – with this group of veterans demanding atonement and more. Throughout the Cold War, the symbolic center of the standoff between the Soviets and the West was Germany, split in two - much as the whole of Europe was - by the infamous Iron Curtain. But now, in Ukraine, a new center has emerged in the rivalry between East and West, dividing the country in ways that could prove just as enduring as the decadeslong partition of Germany. This week marks the second anniversary of the Euromaidan uprising that drove former Ukrainian President Viktor Yanukovich from power, shaking Ukraine to its foundations and driving Russia-West relations to their lowest point since the end of the Cold War. Much has changed in the two years since: A pro-West government formed in Kiev, Russia annexed Crimea, and a rebellion in eastern Ukraine developed into a full-fledged war. Meanwhile, the United States and the European Union have levied sanctions against Russia. Moscow has responded with countersanctions against the West. Economic activity between Ukraine and Russia has ground to a halt. As the Ukrainian conflict enters its third year, a flurry of negotiations aimed at ending hostilities is taking place. At higher levels, officials are holding talks in Normandy to address the conflict's political aspects, while on the tactical front, there are discussions in Minsk to sort out the details of a cease-fire. Alongside both, countless bilateral meetings are being held. Occasionally, these talks renew hope that a lasting agreement can be reached. In reality, though, Ukraine's crisis is not a short-lived skirmish that a little additional negotiation can resolve. Rather, it is a deep-seated conflict, rooted in geopolitics, that stretches back centuries and will likely continue to exist in some form for many more years. Understanding Ukraine's role in the Russia-West rivalry, with its similarities to Germany's role during the Cold War, is crucial to envisioning how Europe's future may evolve. Ukraine has long been a polarized country. Strategically located on the open plains of Eastern Europe, the country can trace its divisions to the numerous powers and empires that sought to claim shares of its territory. Ukraine first belonged to Kievan Rus, a medieval Eastern Slavic state centered on Kiev that encompassed modern-day Russia, Belarus and Ukraine. But the kingdom began to decline, eventually falling to the Mongols in the 13th century, and the center of Eastern Slavic power shifted to Moscow. Kiev, and the territory that today makes up Ukraine, languished. A new study by Canadian academics says Mother Teresa was a product of hypewho housed the poor and sick in shoddy conditions, despite her access to a fortune. The Times of India, reporting on the controversial essay, wrote that the authors asserted Mother Teresa saw beauty in the downtrodden's suffering and was far more willing to pray for them than provide practical medical care. Meanwhile, researchers say, the Vatican engaged in a PR ploy as it threw aside concerns about her suspicious financial dealings and contacts to forgo the five-year waiting period to beatify her. The research paper claims that the celebrated nun had 517 missions in 100 countries at the time of her death, but that the majority of patients were not cared for properly and many were left to die, according to the university website. In addition, the Vatican is said to have ignored a doctor's assertions when it concluded that a Mother Teresa miracle healed a woman who had tuberculosis and an ovarian cyst. Researchers Carole Senechal of the University of Ottawa and Larivee and Genevieve Chenard from the University of Montreal came to their conclusions by examining 96 percent of the originally researched, published works about Teresa, according to the U of M website. Their findings are to be published in French-language journal Studies in Religion/Sciences. Some of their references included medical journals and British journalist Christopher Hitchens, who called Mother Teresa a "fraud." Other researchers have criticized Mother Teresa's efforts in the past. Mother Teresa: A Biography, written by Meg Greene and published in 2004, recounts an article by the Lancet medical journal that outlined the neglect and lack of expertise in a Calcutta facility established by Mother Teresa. The Army has announced new body armor, helmets, combat shirts, and pelvic protectors that weigh less, allow soldiers to move more easily, and provide better protection from blasts and bullets than the current kit. The Army’s current body armor, the Improved Outer Tactical Vest, was originally fielded in 2007 and many vests are reaching the end of their service life. Rather than replace them with identical units, the soldiers who oversee procurement for the Army at the Program Executive Office Soldier wanted new vest designs that would provide better protection. What they came up with is the Torso and Extremities Protection system, which is expected to reach soldiers in 2019. The TEP armor features greater protection for soldiers’ torsos while reducing weight from an average of 31 pounds to only 23. The armor can be further lightened by removing certain elements when greater mobility is essential, like for troops scouting enemy positions or sneaking through dangerous areas. An effort to develop new ballistic plates could reduce the weight even further. The new materials being tested perform at the same level or higher than IOTV plates and weigh 7 percent less. Pakistan finally ended up owning the acts of terrorism committed in India from its soil when, on February 22, it went public through Sartaj Aziz that at least one call made by the terrorists was traced to the Jaish-e-Muhammad (JeM) HQ, the covert-warrior outfit in south Punjab. There was widespread relief that Islamabad had finally decided to stamp out terrorism in the province. Is there hope in it for an Indo-Pak détente? But Musharraf got more hits on social media when he said Pakistan was amiss in not announcing to the world it was India, in cahoots with Kabul, that was doing terrorism in Pakistan, killing schoolchildren and university graduates. He recalled that as president he had once insulted current Afghan President Ashraf Ghani at a meeting in Ankara. In office, Musharraf had refused to accept the Afghan Taliban leadership was being “kept” in Quetta while the Americans tried to pacify a country they were desperate to leave. Kabul ran with the line from their secret service that Mullah Umar was conducting the savage terrorism from inside Pakistan. Musharraf dramatically rebutted the charge and said the Taliban phone numbers in Quetta provided by Kabul were bogus. Last year, as news of Mullah Umar’s secret death surfaced, most Taliban-watchers thought the enigmatic one-eyed leader could have been living all the while in Quetta or Karachi. Mullah Akhtar Mansoor, who leads the Afghan Taliban today, is still reportedly based in Quetta. The story behind the Nemtsov assassination begins with the 2014 Euromaidan uprising in Ukraine a year before. The popular protests that ousted Kiev’s pro-Russia government took Moscow by surprise. Russia’s deep networks of influence unexpectedly failed to prevent a change in government, and only a sliver of eastern Ukraine rose up in defiance of the pro-Western government. For Kremlin insiders, blame for the failure fell squarely on the shoulders of the FSB, which held the main portfolio responsible for influence and intelligence inside of Ukraine. As a result, the FSB briefly lost its lead position overseeing Ukraine and, moreover, Putin reportedlyrestructured the group shortly thereafter. Is special warfare relevant to today's conflicts? How should special warfare campaigns be designed? What capabilities are necessary to successfully conduct special warfare campaigns? What are the strategic advantages and risks of employing special warfare? Hybrid irregular and conventional military operations are playing an increasingly prominent role in international conflict, exploited by countries such as Russia and Iran. The United States requires new approaches for exerting influence, filling the "missing middle" — between the limitations of distant strike and the costly, indefinite commitment of conventional forces — to counter these increasing threats. Special warfare provides policymakers with an additional option that can help secure U.S. interests and manage risks. These campaigns stabilize a friendly state or destabilize a hostile regime by operating through and with local state or nonstate partners, rather than through unilateral U.S. action. Currently, there is no shared understanding of how special warfare campaigns should be designed and executed. This RAND study sought to fill this gap by (1) adapting conventional operational art to the unique characteristics of special warfare, (2) identifying the strategic advantages and risks associated with special warfare, (3) exploring how special warfare campaigns could be used to address challenges identified in strategic guidance, and (4) proposing a framework for military and civilian leaders to design and execute these campaigns. The research indicates that the U.S. Department of Defense should strengthen its special warfare planning capacity and culture, implement institutional reforms to facilitate unified action among relevant U.S. government agencies, and develop enhanced influence capabilities. An accompanying appendix volume provides additional context to supplement the analyses presented in this report. Special warfare campaigns have a distinctive focus that could include stabilizing or destabilizing a targeted regime, employing local partners as the main campaign effort, and maintaining a small U.S. footprint in the targeted country. They also may employ political warfare methods to mobilize, neutralize, or integrate individuals or groups from the tactical to the strategic levels. Special warfare campaigns are typically of long duration and may require extensive preparatory work better measured in months (or years) than in days. Special warfare campaigns require intensive interagency cooperation. For example, the U.S. Department of Defense may be subordinate to the U.S. Department of State or the Central Intelligence Agency. Commanders and planners must be proficient in all relevant forms of operational art, including special warfare, if they are to design successful campaigns across the full range of military operations in modern conflicts. Keeping special warfare within the joint operational art construct will enable collaboration between special operations and conventional forces; the principles of operational art connect tactical actions and strategic objectives by supporting the design of successful campaigns. Special warfare makes a unique contribution to operational art in terms of the mobilization of partners' strategic and operational centers of gravity, and the neutralization or integration of the enemy's, in the human domain. There should be a joint effort to educate special warfare campaign planners as a way of strengthening special warfare strategic and operational planning capabilities. At the same time, because special warfare campaigns are inherently joint efforts, the special warfare community should help joint organizations develop a special warfare planning culture. Special warfare commanders and planners should help policymakers explore the implications of particular strategic objectives. Policymakers, in turn, should strive to provide clear policy guidance to inform the development of campaign plans. The special operations community should consider establishing a general officer–level operational headquarters element as a way to remedy the current ad hoc command-and-control architecture that has inhibited special warfare commanders' ability to participate in theater-level planning. George Friedman's take on the week in geopolitics. The Syrian ceasefire will be ineffective at building peace and will not lead rebel groups to form a united front. The focus of this week was Syria. Diplomats of global powers, including the United States and Russia, sought to craft a ceasefire. Today, 97 armed groups who are part of the Syrian opposition to President Bashar al-Assad’s regime agreed to a two-week truce beginning at midnight. Each side warned the other that they would respect the ceasefire so long as the other side did. We should pause for a moment to consider the fact that there are more than 97 distinct groups waging a civil war against a still united regime. There had been a general expectation that in due course the Assad regime would collapse in the face of this highly factionalized opposition. The fact that there are 97 opposition groups agreeing to the ceasefire is the reason Assad hasn’t fallen. An opposition divided into 97 distinct groups is not going to overthrow anyone. Certainly, there are larger and smaller groups, and more and less important groups. But each group exists because it represents some interest distinct from others, if only the personal ambitions of the leaders. Each military operation requiring cooperation – and any operation must have cooperation to be effective – must be negotiated. Assad’s opponents are as concerned about their position within the broader opposition as they are in overthrowing Assad. The goal could not have been simply to overthrow the regime. It had to take into account each group’s power within the opposition, as that would determine their roles in a government. In Venezuela, the opposition attempted to overthrow President Hugo Chávez over a decade ago. The people staging the coup sent Chávez to an island offshore. They fell to arguing with each other over who would hold which post in the new government. They forget about Chávez, who got on a plane and returned to Caracas. The coup failed. I have long thought that, in the history of attempted coups, the one that tried to overthrow Chávez was the wackiest. I am now convinced that the Syrian opposition would be the funniest, except that it has helped create a human catastrophe of monumental proportions – a catastrophe that is far from over. War requires both a unified command and the ability to make decisions quickly, sometimes within minutes. If that is not possible, the best the opposition group can hope for is not to be destroyed. In a certain sense, this is worse than a defeat because it prolongs the war without any hope of success. True, it prevents Assad from taking his inevitable vengeance on his enemies, and that is important. But the casualties of the war itself, even without defeat, are horrific. As I exited the South Block, its magisterial domes carved in cream and red sandstone were a mere silhouette on that dim, foggy morning. Thought to be the finest specimens of Indo-Gothic architecture, the dizzyingly tall ceilings and wide spaces projected the vastness of a young, burgeoning republic that has often pursued diplomacy with a certain meditative detachment, almost emblematic of its spiritual heritage. At Vijay Chowk, a missile launcher got stuck at the turn, as motorised tableaux depicting the lives and cultures of many Indian states made their way to the rehearsal of the Republic Day parade. A nation relishes the conventional symbols of authority, with spatiality and symmetry defining their grandeur. It’s a primal trait among our societies to equate power with presence. Concluding my meeting with a senior functionary of the Ministry of External Affairs (MEA), it was the conspicuous absence of a dimension of power – both in the colonnades of diplomacy and the parade outside – that left me amused, if not surprised. Cyberspace, where all the known equations of spatiality or symmetry fail, is a parallel universe with its own causal laws. And like gravity, it tears through our physical reality even in its feeble but extremely influential form. Shaking my head, I remembered that it wasn’t the first time I had visited this nerve centre of the government with some reluctance, stemming from the futility of making such efforts. I have tasked myself to highlight a gap which, if left unaddressed, could affect our global posturing. It’s not a gap that can be bridged by the mere convergence of disciplines; it would require the creation of altogether new ones. The US and Russian fighter jet design philosophy diverge vastly when it comes to stealth. The Russians believe stealth cannot help win an air-battle, whereas the US have over-emphasised stealth. The Indian Air Force is better off with the Russian philosophy: non-stealth aircrafts are affordable and easy to maintain. Stealth is the elemental difference between 4th and 5th generation fighter aircraft. But believing that it is the cloak of invisibility is living in a false reality. The Americans claim their stealth aircraft have “first look/first shot/first kill” air dominance capability. The aim is to see the enemy first while avoiding detection. To be sure, the hundreds of billions of dollars spent have paid off in reducing the radar cross sections of the F-22 and F-35. In comparison, the Russian PAK-FA has a larger profile on radar. But the stealth advantage of the US aircraft doesn’t seem to worry the Russians. For, the PAK-FA embraces an entirely different combat philosophy where super maneuverability – first mastered by Sukhoi engineers – is considered a vital weapon. Taken by surprise, the numerically superior, full-strength, 2,500-man Iraqi brigade with T-72 tanks in defensive positions supported by mines, artillery and infantry with anti-tank weapons was swept away in a battle of annihilation. Attacking American soldiers lost one dead, six wounded and one destroyed Bradley. Americans in Washington were surprised. A chorus of television pundits, academics and retired Army generals had warned that American soldiers would suffer heavy casualties. Retired Army Chief of Staff Gen. Edward Meyer actually declared that war with Iraq would produce 10,000 to 30,000 US casualties. The generals commanding Army forces in the Middle East worried that Meyer was right. They had not seen action since Vietnam and they irrationally inflated the Iraqi Army’s fighting power. They should have known better. The courageous and intelligent performance of American soldiers in battle of 73 Easting was testimony to the superior combination of training, technology and human capital that the US Army’s post-Vietnam leadership, Gens. William DePuy, Paul Gorman and Donn Starry, began building in the mid-1970s. DePuy, the commander of Training and Doctrine Command (TRADOC), was the principal force driving change. DePuy saw warfare through a different lens. He had led an infantry platoon from Utah Beach through the Battle of the Bulge in WW II. DePuy acknowledged the US Army’s defeat in Vietnam, but he knew the US Army had to change its focus to fight a capable opponent like the Soviet armed forces. Israel’s sobering experience in the 1973 war with Egypt and Syria reinforced DePuy’s conviction that the Army needed a new warfighting doctrine to guide investments in human capital, organization, and technology. The battle of 73 Easting was DePuy’s crowning achievement. Sadly, war often makes victorious armies stupid and Desert Storm was no exception. Twenty-five years later, DePuy’s Army is in ruins. Thanks to a series of multibillion-dollar acquisition failures like the sprawling $20 billion Future Combat System, the Ground Combat Vehicle and Armed Aerial Scout, the US Army is caught in a modernization death spiral. The outcome is an unfocused, single-service acquisition plan designed to upgrade 1980s vintage platforms and weapon systems or selectively replace systems inside the old structure on a one-for-one basis with comparable, more expensive versions of existing aircraft, tanks, trucks and guns. They don’t hate ‘our freedoms.’ They hate that we’ve betrayed our ideals in their own countries—for oil. In part because my father was murdered by an Arab, I've made an effort to understand the impact of U.S. policy in the Mideast and particularly the factors that sometimes motivate bloodthirsty responses from the Islamic world against our country. As we focus on the rise of the Islamic State and search for the source of the savagery that took so many innocent lives in Paris and San Bernardino, we might want to look beyond the convenient explanations of religion and ideology. Instead we should examine the more complex rationales of history and oil—and how they often point the finger of blame back at our own shores. America’s unsavory record of violent interventions in Syria—little-known to the American people yet well-known to Syrians—sowed fertile ground for the violent Islamic jihadism that now complicates any effective response by our government to address the challenge of ISIL. So long as the American public and policymakers are unaware of this past, further interventions are likely only to compound the crisis. Secretary of State John Kerry this week announced a “provisional” ceasefire in Syria. But since U.S. leverage and prestige within Syria is minimal—and the ceasefire doesn’t include key combatants such as Islamic State and al Nusra--it’s bound to be a shaky truce at best. Similarly President Obama’s stepped-up military intervention in Libya—U.S. airstrikes targeted an Islamic State training camp last week—is likely to strengthen rather than weaken the radicals. As the New York Times reported in a December 8, 2015, front-page story, Islamic State political leaders and strategic planners are working to provoke an American military intervention. They know from experience this will flood their ranks with volunteer fighters, drown the voices of moderation and unify the Islamic world against America. As Washington and Moscow join efforts to initiate a ceasefire in war-torn Syria, there is growing evidence that Russian policymakers believe the cost-benefit side of the military intervention is yielding political dividends. Despite the low-cost and low-risk side of the military equation, limited in terms of the deployment size or sustaining this even over the long term, Moscow perceives its diplomatic benefits as outweighing any potential damage. Indeed, as the frequency of bilateral contact on Syria with Washington continues to grow, Moscow interprets this as confirming its indispensability. Russian analysts appreciate the complexity of the conflict, noting that the intervention is unlikely to offer any military solution. Yet, the political and diplomatic impact of Russian air operations, and signs of success in aiding the Syrian Arab Army (SAA) reveal careful planning. For instance, Moscow’s air campaign in Syria is reportedly also closely tied to a “multi-layered” intelligence system functioning on the ground alongside its coalition partners (Bmpd.livejournal.com, February 18). One factor frequently raised by Western experts is the potential for Russia’s assertive foreign and security policies to be scaled back due to straightened economic times. However, despite trimming the overall defense ministry spending plans, there seems little prospect that economic considerations will drive the Kremlin to change its Syria policy. A source close to the defense ministry leadership told Vedomosti that military expenditure will be reduced this year by around 5 percent. Apparently, since the economic crisis began, the defense ministry was compelled to reduce its budget, with an approximate reduction for 2015 at around 3.8 percent. Based on current defense budget plans, the spending levels for 2016 will be cut by 160 billion rubles ($2.1 billion). Although these cuts appear quite significant, it is unlikely to have any real bearing on capabilities or on the ongoing air operations in Syria. Procurement priorities will remain the same, with some delays and projects moved around in order to compensate for such budget cuts. This is likely to delay lower priority areas such as on conventional weapons systems for the Navy and the Air Force. Vedomosti’s interlocutor is convinced that the 5 percent cut to defense expenditures will have no implications for the air campaign in Syria, which he characterizes as planned from the current budget and at relatively low “annual costs” (Vedomosti, February 19). THE battle is joined, at last. David Cameron has called a referendum on Britain’s membership of the European Union for June 23rd, promising to campaign hard to stay in. What began as a gambit to hold together his divided Tory party is turning into an alarmingly close contest. Betting markets put the odds that Britons opt to leave at two-to-one; some polls suggest the voters are evenly split; several cabinet ministers are campaigning for Brexit. There is a real chance that in four months’ time Britain could be casting off from Europe’s shores. That would be grave news—and not just for Britain. A vote to leave would damage the economy, certainly in the short term and probably in the long run. (As financial markets woke up to the prospect, the pound this week fell to its lowest level against the dollar since 2009.) It would imperil Britain’s security, when threats from terrorists and foreign powers are at their most severe in years. And far from reclaiming sovereignty, Britons would be forgoing clout, by giving up membership of a powerful club whose actions they can influence better from within than without. Those outside Britain marvelling at this proposed act of self-harm should worry for themselves, too. Brexit would deal a heavy blow to Europe, a continent already on the ropes. It would uncouple the world’s fifth-largest economy from its biggest market, and unmoor the fifth-largest defence spender from its allies. 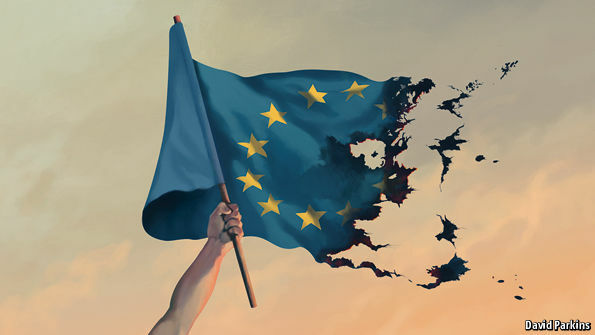 Poorer, less secure and disunited, the new EU would be weaker; the West, reliant on the balancing forces of America and Europe, would be enfeebled, too. The Brexiters’ case is that Britain is held back by Europe: unshackled, it could soar as an open economy that continued to trade with the EU and all round the world. That is possible in theory, but as our briefing (see Briefing) explains, it is not how things would work in practice. At a minimum, the EU would allow full access to its single market only in return for adherence to rules that Eurosceptics are keen to jettison. If Norway and Switzerland (whose arrangements with the EU many Brexiters idolise) are a guide, the union would also demand the free movement of people and a big payment to its budget before allowing unfettered access to the market. Today a planned cease-fire could bring most if not all hostilities to a halt. "The coming days will be critical and the world will be watching," US-President Barack Obama said on Thursday. The agreement could be a first step towards ending the chaos and violence in Syria, Obama added. Fighting should cease from Friday at midnight local time. At a meeting in Munich two weeks ago, the 17-nation International Syria Support Group (ISSG), which includes the United States, Russia and other major powers, agreed to work towards the cessation of hostilities. However, the U.S. and Russia had also agreed that the fight against the extremist Islamic State (IS) and the al-Qaida affiliated Nusra Front would continue with full force. The Syrian government under President Bashar al-Assad, which is highly dependent on Russian military support, is likely to stick to the deal. Almost 100 rebel factions fighting Syrian government forces have also agreed to respect the cessation of hostilities. The war in Syria is now in its fifth year and more than 250,000 people have been killed, some sources counting more than 400,000 dead. Approximately 13.5 million people have been displaced. As the chart below shows, the country is on the brink. The United Nations will convene a new round of peace talks possibly beginning in March. A first round of talks had been abruptly aborted early on in February. U.S. Shale Gas Sets Sail…Now What? On February 24, a tanker carrying liquefied natural gas (LNG) left the Sabine Pass LNG terminal off the coast of Louisiana. The first LNG cargo from Cheniere Energy Inc.’s Sabine Pass LNG Project is a significant milestone for the U.S. energy industry, marking the dawn of shale-based LNG exports by the United States. What other implications does the Sabine Pass export have for the United States? Does the shipment foretell the economic viability of U.S. LNG projects or the competitiveness of U.S. LNG exports? This Critical Question illustrates the significance of the Sabine Pass LNG shipment and considers the opportunities and challenges for the U.S LNG export business in the period of low energy prices. Q1: Is the United States exporting natural gas for the first time? A1: The United States is hardly new to the gas exporting business. The United States has been exporting natural gas to Asia—primarily Japan—in the form of LNG from Alaska since the late 1960s and to its North American neighbors, Canada and Mexico, via pipelines since the early 1970s and as LNG and compressed natural gas (CNG) more recently. Moreover, the United States has a history of reexporting the volumes imported into the United States that U.S. markets no longer need. The customers for reexports have included Brazil and Chile in South America, Spain and the United Kingdom in Europe, as well as China and India in Asia. Q2: What makes the Sabine Pass LNG export special? A2: The Sabine Pass facility is the first of the U.S. LNG export projects to have applied for and obtained U.S. government export authorization since the onset of shale gas production transformed the North American natural gas market. Authorized in 2011, the project became the first to liquefy U.S. natural gas extracted from shale and other tight formations and ship it to overseas destinations. The U.S. Armed Forces—or Global Rent-a-Force? The New York Times reported on Friday that the Pentagon is recommending dozens of special operations troops be sent into Nigeria to help their troops battle the terror group Boko Haram. “Their deployment,” the Times reported, “would push American troops hundreds of miles closer to the battle that Nigerian forces are waging against an insurgency that has killed thousands of civilians. . .” This request represents merely the most recent manifestation of Washington’s growing addiction to casually sending combat forces around the globe. The threat to American national security these military missions are alleged to solve is getting harder to discover. But one thing is clear: cumulatively they areworsening our security, costing billions in unnecessary expense and placing an ever-increasing burden on the backs of the men and women who defend America. Many studies have been published detailing how the repeated deployments to Iraq and Afghanistan in the mid-2000s put severe strains on military membersand their families. It appeared there would be relief from the pressures when the operation in Iraq ended in 2011 and the combat mission in Afghanistan ended in 2014. But since that time many other missions have arisen and others have been expanded. With the rise of the Islamic State (ISIS), American troops were sent back into Iraq in 2015. The Chairman of the Joint Chiefs of Staff is presently considering moving advisors closer to the fighting there. Five thousand American troops were scheduled to be redeployed from Afghanistan this year, but the commander of U.S. troops there has requested they be left in place. U.S. Special Operations troops are reportedly operating on the ground in Syria against ISIS. Also under consideration is thedeployment of U.S. troops into the violence in Libya. All the potential deployments above are overlaid atop the missions the Armed Forces are already conducting in Pakistan, Somalia, Yemen and elsewhere. Apple and the US government are squaring off in an epic legal battle with wide-ranging implications for how technology firms must work with law enforcement. The US government earlier this month sought a court order to force Apple to help unlock an iPhone as part of the probe into last year’s San Bernardino attacks. The highly charged case has created a sharp divide between those who say that users of devices like smartphones should be able to keep information private through encryption, and others who claim legitimate law enforcement investigations should take precedence when courts approve. Apple is challenging the California court order, saying the type of cooperation sought would undermine basic principles of data security and open new vulnerabilities for all its users. The government is asking for the creation of software that doesn’t exist, an abuse of the law and violation of the company’s constitutional rights, Apple says. It adds that creating a weaker “government OS” would undermine the encryption Apple and others have been introducing, and ultimately leak out to hackers and foreign governments. “Apple wants to maintain the trust relationship with its customers, they feel deeply and firmly this is something that has to exist, and that no government should have access to this data,” said John Dickson of the Texas-based Denim Group, which manages security and encryption for its customers. A group they've dubbed "Lazarus Group" is well organized and tied to numerous other attacks on governments, banks, and military institutions in the US and South Korea since 2009. More than a year after the devastating Sony Pictures hack, a trio of cybersecurity firms claim to have pinpointed the culprits behind the breach that rattled Hollywood and invigorated President Obama's cybersecurity agenda. The companies said in a report released Wednesday that an outfit it dubs "Lazarus Group," which has carried out high-profile attacks on government agencies, militaries, and banks in the US and South Korea since 2009, is responsible for the Sony Pictures incursion in November 2014. The firms didn't connect Lazarus Group directly to North Korea, which US law enforcement and many security experts believe funded the Sony Pictures hack in retaliation for the "The Interview," a comedy distributed by Sony about an assassination plot against North Korean leader Kim Jong-un. "What we've found clearly communicates a very well resourced organization that is extremely well-motivated, extremely well-organized, and has demonstrated since 2009 their ability to operate," said Andre Ludwig, the senior technical director at Novetta, a Virginia cybersecurity firm. It published the report along with AlienVault and Kaspersky Lab. Their research also connected Lazarus Group to distributed denial of service, or DDoS, attacks that targeted South Korea's government, military, and major banks in 2011, as well as to "Operation Troy," a military espionage campaign targeting South Korea. The report found traces of the Lazarus Group's malware in China, India, Japan, and Taiwan. That could indicate the Sony hack was the work of one group – or closely linked networks – that potentially collaborated on technical resources, attacks, and coordinated server infrastructure. The hackers appeared to communicate in Korean, according to malware samples the researchers analyzed. The security researchers say they based their finding on hundreds of millions of malware samples related to Sony and other hacks – ultimately attributing 2,000 samples and 45 families of malware to the Lazarus Group. This is a shloka from the Bhagavad Gita (BG). Actually, it is one and a halfshlokas, shloka number 26 and half of shloka number 27 from the firstChapter. By the way, almost everyone refers to the text as Bhagavad Gita and so have I. That’s grammatically wrong. Following rules of sandhi, one should either say Bhagavat Gita or Bhagavadgita. Before the battle, Arjuna asks Krishna to station the chariot between the two armies, so that he can see who he has to fight with. That’s when this shloka occurs and one has a list of father, grandfather, preceptor, maternal uncle, brother, son, grandson, friend, father-in-law and well-wisher. That more or less covers every masculine relative one can think of. A few shlokas later (shloka 34 to be precise), there is another such listing and that adds brother-in-law and matrimonial ally. Who am I? Confronted with such a question, we often define ourselves in relation to our masculine or feminine relatives. I am someone’s son/daughter, father/mother, brother/sister, spouse and so on. Incidentally, the word बन्धु (bandhu) is often used in the sense of friend, but is really a relative related by blood. बान्धव (bandhava) is a distant relative or kin, or even someone related by marriage. Depending on the gender, सखा (sakha) or सखी (sakhi) is friend. Though used in the sense of friend, मित्रम् (mitram) is more like colleague. However, since usage isn’t always invariant, let’s not bother about the taxonomy. On February 22, which was a public holiday in Russia, President Vladimir Putin went on national television with a newsflash to announce that, after a phone call with the United States’ President Barack Obama, a US-Russian agreement was secured to declare a ceasefire in the Syrian civil war beginning on midnight, Friday, February 26 (local time). The ceasefire does not cover the Islamic State (IS), al Qaeda-linked Jabhat al-Nusra (al-Nusra Front), or “other [United Nations]-designated terrorist organizations [unspecified].” Syrian opposition forces that decide to join the ceasefire must report to the Russian military command in Syria or to the Americans, who are expected to exchange notes. Humanitarian relief will be delivered by the UN to besieged civilian population centers. A successful ceasefire must lead to a political solution of the Syrian problem through dialogue (Kremlin.ru, February 22). The Russian military has established a ceasefire coordination center at the Russian airbase of Hmeymim, close to Latakia. Syrian opposition fighters that agree to lay down arms must register and are promised they will not be bombed. The Russian press is reporting droves of Syrian opposition fighters raising white flags and laying down their arms. The IS, al-Nusra Front and apparently any other Syrian opposition forces that continue to resist will be bombed relentlessly. The Russian Ministry of Defense announced it is in contact with the defense attaché’s office of the US embassy in Moscow, while accusing Turkey of “aggression against Syria,” of working to derail the tentative ceasefire agreement, and of attacking Kurdish People’s Protection Units (YPG) in northern Syria (RIA Novosti, February 24). It’s an honor to be here with all of you, I regard you as the single most intelligent and therefore the single toughest and most productive audience for my ideas. My intent is to place your world-charging efforts with respect to Open Data in a larger context, what I have been calling Open Source Everything Engineering, and to relate that to where I hope we end up one day, with Open Power. Here is the plan of the brief, 24 slides in 24 minutes, followed by whatever you wish in the way of questions and interaction. I two sub-topics and six slides for each of these three broad areas where we might reflect together on the possibilities. With respect to Open Data, where you are arguably the foremost proponents in the world, I want to sound the alarm, as a professional intelligence officer, with respect to just how impoverished we are in relation to both the data we can access, and the lack of tools for exploiting that data. “If the round is completed in full, Palantir’s total funding could swell to about $1.2 billion. It’s currently unclear what the company would be valued at if it were to raise the $400 million round…. “Palantir previously raised about $450 million at about a $9 billion valuation in a round that began in December of last year. That round finally closed in September, after the company continued to add additional shares and investors. Current Panantir investors include In-Q-Tel and Tiger Global Management, and co-founder Peter Thiel remains its largest shareholder. It seems unlikely that the growing company will go public any time soon; last year, CEO Alex Karp noted that Palantir’s existing relationships with government agencies and global corporations make the company ill-suited for IPO status. Defense officials' hopes for sweeping personnel reforms were crushed by Senate Republicans on Thursday who attacked the ideas as “an outrageous waste of time” and the Pentagon’s pick to implement them as unfit to serve. Brad Carson, the nominee to serve as undersecretary of defense for personnel and readiness for nearly 11 months, received blistering criticism from members of the Senate Armed Services Committee for his work over the past year on the Force of the Future plan, work aimed at updating the military’s personnel system to better compete with civilian business benefits. The 49-year-old former congressman and Iraq War veteran worked as the personnel office’s acting head for most of 2015, becoming the public face for the reform plans. But senators accused him of presuming confirmation and failing to inform them about the proposed historic changes, many of which would require dramatic legislative changes. “I find it deeply disturbing that you are proposing to add expensive fringe benefits allegedly aimed at retention during a time when we are asking 3,000 excellent Army captains to leave the service who would have otherwise chosen to remain on active duty,” said Senate Armed Services Committee Chairman John McCain, R-Ariz. It turns out that Russia has a much more advanced electronic and cyber warfare capability than the US, which has bet on the wrong horses, such as counter-insurgency, and has now to rebuild its capacities to catch up with Russia’s electronic warfare expertise. Caught Off-Guard: Russian Military Hardware More Than a Match for US, NATO“The United States will have to rebuild its capacity to counter Russia’s electronic warfare expertise in Europe,” Defense Editor Dave Majumdar writes in his article for The National Interest magazine. Apple chief executive Tim Cook is such a respected figure that it’s easy to overlook the basic problem with his argument about encryption: Cook is asserting that a private company and the interests of its customers should prevail over the public’s interest as expressed by our courts. The San Bernardino, Calif., encryption case was the wrong one to fight. Apple doubled-down Thursday by asking a federal court to vacate its order that the company create a tool to unlock the iPhone of shooter Syed Rizwan Farook. But if a higher court ultimately requires Apple to do that, as seems likely, the company will be seen by privacy advocates at home and abroad as having been rolled by the U.S. government. Foreign governments may demand similar treatment. Neither outcome is in Apple’s interest.